Susan Lee and Heyl Sanctuaries - Wellesley Conservation Council, Inc. The Susan Lee Memorial Sanctuary was given in memory of the mother of Mrs. Allen N. Bennett, Jr in 1964. (The Lee family once owned much of the land in this area). It consists of 8 acres divided into two parts by Livingston Road. The larger part of the sanctuary is to the east of Livingston Road. The other part lies between Livingston Road and the Charles River and provides frontage along the banks of the river. 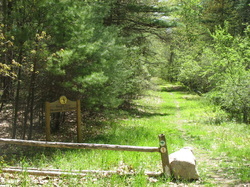 The Wellesley Trails' Guernsey Path bisects the Sanctuary. To find out about the history of the Susan Lee Sanctuary click here.